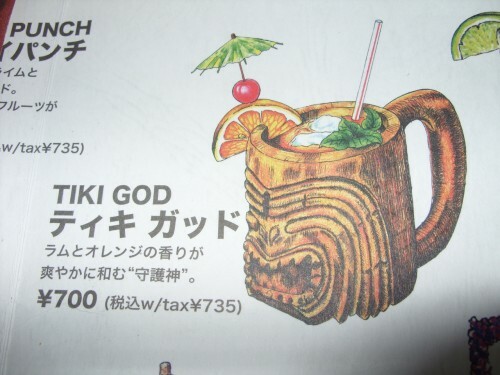 Was looking in the drink menu at Sam’s By The Sea here on Okinawa, had to snap a pic of this for Tiki! Shame this isn’t one of the drinks where you got to keep the cup, otherwise I might have ordered one. But is it filled with Jack Daniels? Holy fish and chips! That place is still open? I was there 73 to 76. My dad used to take me there friday nights after the inter-squad softball games. It was all you can eat fish and chips out on the deck, but you had to finish(or make disappear) the fries before you got a new plate. I made a lot of seagulls very fat…..
@Luna: But, but… uggggh. The Shisa drink is one of the WORST ones! It tastes like GRAPEFRUIT!